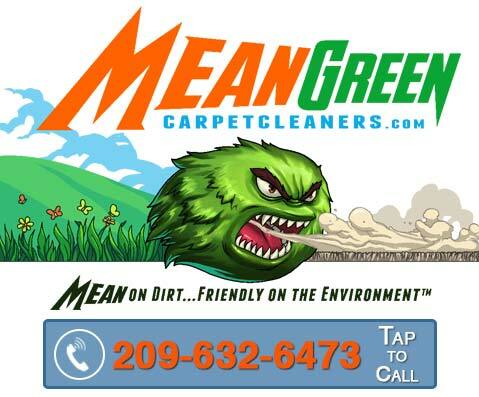 At Mean Green Carpet Cleaners of Turlock “Our Process” starts well before we even show up. Beginning with the some of the best equipment made. Heat and suction mean a lot in this business, that’s why our system is the tried and true Prochem Performer 405 which produces 230+ Deg. of super-heated water, and more than 400CFM of insane suction. Then we specially treat our rinse water prior to, and after heating. First our clean fresh water is softened or stripped of calcium prior to entering our holding tank, and then it is magnetically treated reversing the ionic polarity before and after being super-heated. If this sounds like fluff, it’s NOT. The super-heated water increases the solutions cleaning power by more than 35X’s what a 160 deg. system would do, and allows most of the residual moisture to evaporate much quicker, leaving your carpet dryer faster. The 400+CFM creates such as strong vacuum that it is able to remove soil deep down in to the fibers of even thick shag carpeting along with most of the cleaning rinse water. By stripping out the calcium we’re allowing the water and rinse solution to do its job, instead of being soaked into the porous stone like mineral. Last but not least, reversing the polarity of the ions in the water inclines the water, soil, cleaning/rinse solutions and existing minerals still present in the water, to repel your carpet making it want to leave your carpet, resulting in a carpet that is as residual free as possible. So when we show up to clean your carpet, tile or upholstery, know that MUCH more has already been done prior to us actually cleaning your carpet. Our technician will walk with you through your home and note any areas that need extra attention and also discuss items to be moved. After identifying the carpet’s condition and type we can select the specific carpet cleaning formula to use to clean your carpet. After the pre-inspection we will apply our soil lifting formula to the all areas being cleaned. Our special cleaning formula breaks down the dirt, oils, sugars and other sticky substances that actually attract more dust and bacteria. Once these things have been loosened from the carpet fibers, they are now ready to be rinsed away and extracted using our truck-mounted carpet cleaning machine. In certain cases we may recommend that an antimicrobial deodorizer/sanitizer be applied to the carpet. This will eliminate pet odors as well as any other odors caused by bacteria leaving your carpet fresh and clean. While allowing the pre-spray to dwell and work deep into your carpet, our technician will carefully move any items that will be cleaned underneath and place protective “blocks” or “chips” under the furniture so your carpet can dry properly with no new furniture stains. After the pre-spray has been allowed sufficient dwell time we will extract your carpet using the hot water extraction method also known as Steam Cleaning with our high powered industrial grade truck-mounted carpet cleaning machine. Our rinse is specially formulated to leave your carpet and upholstery residue free so it stays cleaner longer and feels softer. Because of the high powered machine we are able to do a more thorough rinsing of the carpet, while getting the carpet dry faster with our truck-mounted vacuum system. After a cleaning there are sometimes spots that remain. Our technician will do everything possible to treat these spots and remove them now. If your carpet and upholstery is in good shape we may recommend that a protector be applied. This will help keep your carpet cleaner longer by increasing vacuuming efficiency when you clean and prevent any new spots or stains from ruining your investment, and prolong the life of your carpet/upholstery. Upon completion of cleaning our technician will hand groom each carpet or upholstery area cleaned, to help restore that like new knap and increase drying efficiency. Technicians will don clean protective booties prior to any post cleaning re-entry. We will walk with you through your home again to make sure all spots, stains, and traffic areas have been thoroughly cleaned. During the post-inspection we will go over the job with you and note any suggestions for the future that will help improve your carpet’s life and cleanliness as well as answer any questions you might have once the job has been completed. We will leave a high volume air blower for rapid drying, should the situation require it.